Dressing, or stuffing, is one of those dinner elements, especially for the holidays, that you can't go without. 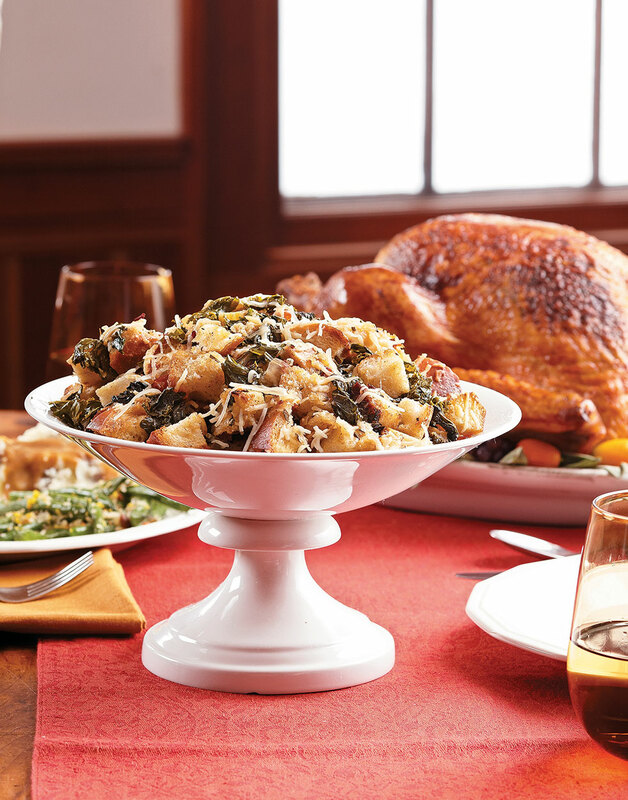 And with crisp bits of pancetta, plus earthy kale, marsala wine, and rosemary, you won't want to. If you like a more moist dressing, double the amount of eggs and chicken broth. Preheat oven to 375°. Coat a 9×13-inch baking dish with nonstick spray. Melt butter in a skillet over medium-high heat. Add pancetta and cook until crisp, 5–6 minutes. Transfer pancetta with a slotted spoon to a paper-towel-lined plate. Stir onions, celery, sage, rosemary, garlic, salt, pepper, and nutmeg into drippings; cook over medium heat until onions soften, 5 minutes. Deglaze skillet with Marsala and simmer until nearly evaporated. Add kale and toss until wilted, 3 minutes; remove from heat. Pancetta is salt-cured pork belly often referred to as Italian bacon. Cook it in butter until it’s crisp. Whisk together the eggs and broth before adding to the bread mixture so it’s evenly distributed.